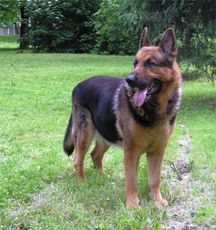 A German Shepherd relative of Harry's in a less-panicked moment. When an organization faces a difficult problem, its leaders face two challenges. First, they must devise a solution, and then they must communicate it to the people they lead. Sometimes, leaders focus too narrowly on the original problem, and view the communication as a secondary annoyance. Too bad for them, because a solution is a solution only if you can communicate it to the people you lead. I learned this one day from a German Shepherd named Harry. It's a prematurely cool late August morning, and I'm doing my daily circuit around Fresh Pond. The pond is warmer than the air, and its mirrored surface steams. I come around a turn in the path and spy a lone German Shepherd — probably a mix — on the path up ahead. He's looking across the meadow anxiously, listening. I hear a female voice from across the meadow calling, "Harry…..Harry…" Harry freezes, ears up. He takes a step toward the voice, but the meadow is fenced here, and he's stumped. It's a vinyl fence, not very high, but insurmountable for Harry. I call to him because the fence ends about 20 feet behind me, and if he sees that, he'll be able to cross the meadow to reach his master. Harry runs the other way. I don't take it personally — he's almost panicked. After about three bounds, he changes his mind, and runs back past me. I figure, well, he'll be OK, and I continue on my way. be more effectiveBut then I realize that the meadow is fenced on the other side, and worse, there's a stretch of high weeds, poison ivy, marsh, and brambles that he'll have to get through. Oh well, I think, not my problem. I continue on my way. Soon Harry appears about ten feet in front of me, in the meadow, on the other side of the fence. Now he's trying to get out, and he's even more panicked than before. I call to him, and lift the bottom of the fence for him to scoot under. He considers it. If he accepts, he'll be able to run around the meadow and reach his master. But he doesn't understand that. To Harry, I seem to be leading in the wrong direction. In the midst of his internal debate, his master calls again. Harry makes a decision. He turns and runs across the meadow toward his master — and the bramble patch. He halts at its edge, unsure. His master calls again. He dives into the brambles, and as he reaches the far fence, his master raises it as I did, and Harry scoots through, tail wagging furiously. His master waves to me, I wave back, and all is well again in our little universe. Would you like to see your comments posted here? rbrenkXhULaGZZeGTPvLYner@ChacNHXixdhnpDMNFXNToCanyon.comSend me your comments by email, or by Web form. I offer email and telephone coaching at both corporate and individual rates. Contact Rick for details at rbrenhxxKUZVnTPfdYSGiner@ChaclRltZMHsRUUscgaYoCanyon.com or (650) 787-6475, or toll-free in the continental US at (866) 378-5470.